Polex Environmental Engineering stocks a series of robust and efficient modular shaker filter dust collectors that are suitable for use in applications with intermittent operation to enable regular cleaning. Requiring no compressed air, these dust collection systems offer airflows ranging from 2,700 to 7,900 m3/h, and are supplied complete with electric start-stop controls. 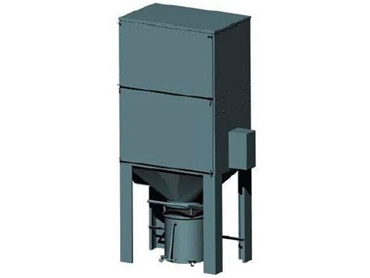 When in operation, polluted air enters through the hopper of these shaker filter dust collectors and is directed through an array of heavy duty envelope filters. Dusty air is drawn through the filters via an extraction fan housed in an acoustically lined chamber at the top of the unit. Once the air is cleaned, it is discharged to the atmosphere, or into discharge ductwork. Cleaning is achieved by a vibrating motor that shakes the frame from which the filter bags are suspended for a preset time, shaking off the dust cake.